A cup holder that won’t spill when carried through a busy café or down a flight of stairs! The design of the SpillNot™ uses the principles of Newtonian physics to keep the liquid in the container. 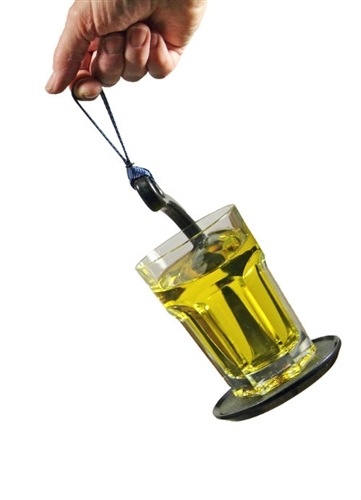 The flexible handle and the location of the suspension point above the center of the tray ensure that the forces on the liquid are always directed towards the supporting tray, even when the tray is in motion. The sideways forces that are usually responsible for spills are not transmitted to the tray by the flexible handle and the radial forces generated during swinging motion only pin the liquid into the container more firmly. An inexpensive demonstration to intrigue students and challenge their analytical powers! Watch our video of the SpillNot in action!